There was a picture going around on Twitter today of the McDonald's FREE WiFi Connection instructions, looks like they are from Australia, copyright 2008. Of course, this isn't the latest and greatest guide to connect to WiFi at McDonald's, so I've included an updated guide here for your reference. Nice. That menu from earlier kind of made me mad. I don't get this? Are you suggesting that it's way harder to connect with a Mac? I assume that your command line instructions could be replaced with GUI instructions. Is that not the case? If so, then why is it so much harder to connect to McDonald's than to other sites? For my local wifi, all I have to do in Snow Leopard is click the Airport menu, Turn Airport On, then select a network and enter the password. If your intention was actually to provide a useful guide, then I fear you are doing a disservice to OS X by making it look way harder than it is. Well it's nice to be in the company of friends here who feel the same as I do. Enough with this Apple craze. Big Whoop. For those who missed it (ahem, BatsShadow) please look closely at the old menu image. 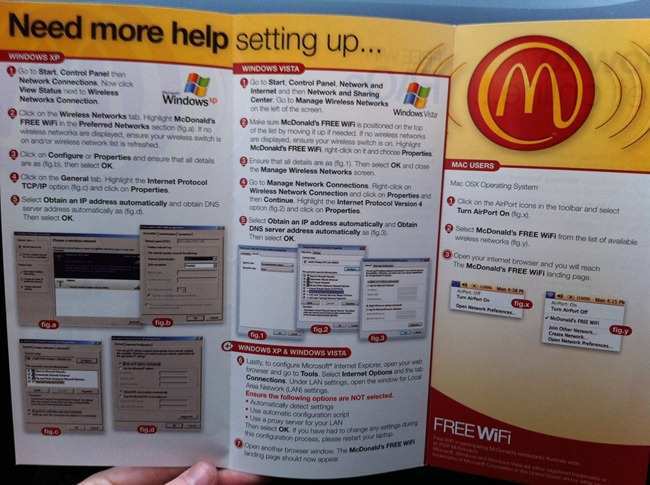 What Scott is doing is making some fun of the fact that McD for some strange reason provided extremely strange and advanced instructions for Windows users while had the Mac instructions really simple. This image has been floating around Twitter the last days and Mac users saying something like "This says it all" when it actually just says that the person who wrote this guide is an incompetent idiot. Sort of. BatsShadow. Read the original menu. Then read ALL of mine. It's satire. A joke. Un chiste. @BatsShadow, that's the point. The "original" graphic was making Windows look way harder than it actually is. 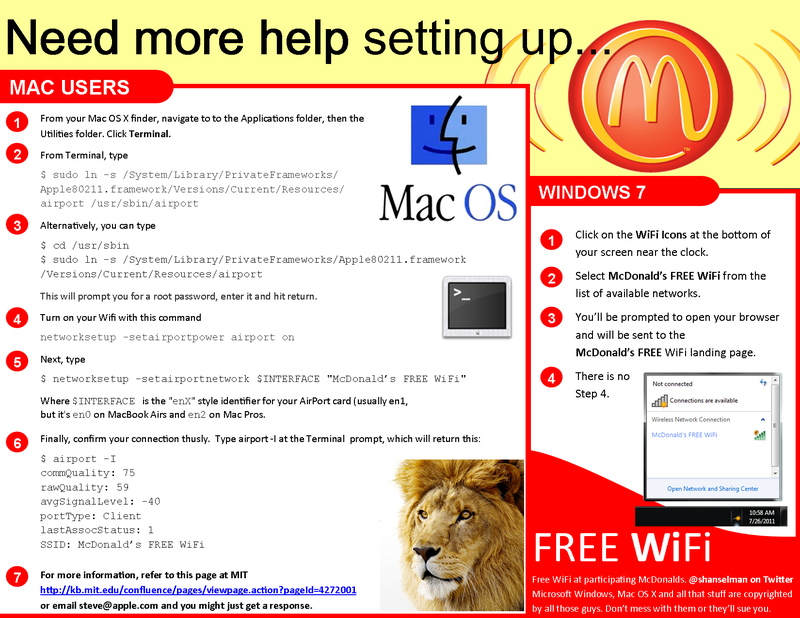 In reality, either OS is generally less than 6 clicks from connecting to an open WiFi network. @BatsShadow: Look at both images. The top image is what was there, the bottom is taking an equally complicated route to connect with Mac OS X. My guess is McDonald's had a much higher volume of Windows users and thus faced many more oddball network configurations that contributed to complaints the free wifi didn't work. So the instructions for Windows were reprinted in excruciating detail, while the Mac instructions were left alone. @BatsShadow This is most certainly a joke, unless there is some strange incompatibility with the way McDonald's does their wifi that I haven't heard about. @BatsShadow - Yesterday the image at top was circulating on Twitter from Mac fans, implying how difficult it is to connect to a Wi-Fi network with a Windows PC. Scott's reply is firing one back over the wall at that lovely crowd. Now where are those Linux instructions? All i take away from this is that the two fact sheets are equally incorrect. I'm not sure creating an additional incorrect fact sheet adds anything constructive to the discussion. I would have liked to see a fact that just shows that OSX and Windows 7 are equivalent. But hey, that's just me. Way to to go Scott, I saw your graphics and I laughed, kudos to you sir. Don't you know that anything that Steve Jobs creates saves babies, saves the planet, helps old people live longer, makes baby seals smile, causes unicorns to appear, makes one's blood sugar always perfect and ends terrorism? I am sure you know all of this and yet to create such a hate filled blog post that demonizes the 6 day creation of all Apple products. What does this say about you as a person? I am thoroughly disappointed and thought you were a better human being. Obviously, you are blinded by your love of the devil (i.e. Windows) and cannot see good when it is right in front of your face. Terry Bunio - I think I just DID show that they are equivalent. And, it's hilarious, so #win #win. Oh, and BTW, I made this in 20 minutes Microsoft Publisher, just because Publisher is hilarious on its own. ha ha ... I had to laugh very hard reading some of these comments from people that don't have any sense of humor apperantly. Scott - LOL some of the comments here are just as funny as your graphic. Shaun McDonnel - WTF?! That IS hilarious! Gotta love those OSes with a Unix base! If only. I can't tell you how many hoops I had to jump through to get my Windows 7 laptop to connect to the wireless network at my old office. Apparently, connecting to a network secured with WPA2-Enterprise when your machine is not a member of the domain is not so straightforward. Every advanced setting must be precisely configured (manually) or no dice. Even more frustrating was the fact that the configuration necessary to get my machine online differed substantially from my colleague's XP machine. It took me 30 minutes to get the blasted thing online. Incidentally, it took all of 15 seconds to connect my iPhone to the same network: I entered my domain credentials, it prompted me with a certificate, and upon tapping 'Accept' I was online. I can only assume the desktop Mac OS configuration is equally straightforward. Why Windows 7 cannot auto-resolve the configuration so elegantly is beyond me. It's leaps and bounds ahead of Windows XP, but it still has a long way to go. Ever get the feeling some people take themselves too seriously? Bracket missing! "(Usually en1)" the bracket that starts in that sentence doesn't end anywhere. Sorry, I can't help it, tend to notice brackets that open and don't close. :D. Rest of it is Hilarious. If you connect your iphone to the corporate exchange watch some one configure their android phone and see what you phone auto accepted because jobs want one burton and one click! ..in fact you don't really want to bring it to their attention that there is a wifi network at all... who knows what they will get up to! but seriously who is "fan" of windows? @BatsShadow all comments on this post should begin with @BatsShadow because there's no way he could have gotten it after the first explanation. >> but seriously who is "fan" of windows? Haha yes, really the most entertaining take away from this post! - What stereotypical Mac fanboy reads a .NET blog? In response to the tweet, I'd liken being humorless to standing on a mound of dildoes. You think you're looking down on people, but they all think you've got something else bothering you. What? No nutritional meal information or dietary needs. Maybe this year for April 1 I'll get a copy of the Burger King ones and go distributing them to McD's around town.